This website intends to publish, with some comments and background notes, many of the poems which were published in local Sligo newspapers in the years beginning with 1912. It is especially interested in those poems written by Sligo authors and will try as far as is possible to identify these authors. This is not always easy, many poems were unattributed, many authors used pseudonyms and it was common practice to include poems from other publications and volumes of poetry without giving the source. There is no suggestion that any or all of these are great poetry. What is interesting is the large volume of such poetry which was published and the range of topics and styles this involved. They are written in the main by so called ordinary people who felt the need to express their thought in verse and have it published for a wide readership. Some poems seem to be one offs, produced for a particular occasion, a death, a political event or a public feeling. Others are written by people who obviously regarded themselves as poets in the sense that they composed and sought publication regularily. 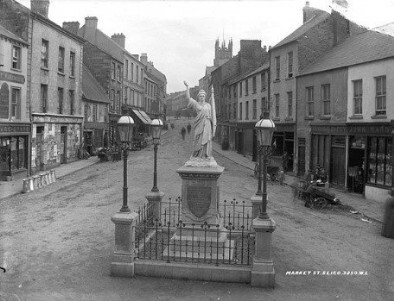 Above: The Lady Erin monument at the junction of Castle Street, Market Street and Grattan Street. This memorial to the 1798 rebellion was begun in October 1898 and unveiled in September 1899. Some explanation on the background to particular poems will also be provided and will some few comments on styles and themes. It is hoped that this project, starting with the year 1912, might continute to 1923. It will be interesting to see how the poetry published will reflect the political upheavals of those years which saw the outbreak of World War 1, the change in attitude among the people, the 1916 Rising, the rise of Sinn Féin and the IRA and the War of Independence, the Treaty and the Civil War. The author would be delighted to hear from anyone with an interest in this period, who knows of other published poetry of the period with Sligo relevance and especially anyone who can help identify the many anonymous poets of the period. The background political events of these years in Sligo are well covered in my book Sligo; The Irish Revolution 1912-1923 published by Four Courts Press in 2012. Other useful books for the social, historical and political background in Sligo at this period are listed in the bibliography on this site. What the bibliography lacks is articles and books dealing with this kind of poetry in Ireland and elsewhere. Suggestions are very welcome.